Home Learning Center Basics Greenhouse gases: how can solar energy reduce CO2? Greenhouse gases: how can solar energy reduce CO2? Earth receives almost all of its energy from the sun in the form of ultraviolet rays and or infrared rays. Around 50% of the energy contained in those rays is absorbed by gases and the rest is reflected back to the clouds. The gases that absorb energy are commonly known as Greenhouse Gases. One of their major roles is to maintain the eco-system by keeping the earth`s temperature at a roughly constant level. In this article we discuss how solar energy can help to reduce greenhouse gases. Typically, Greenhouses are glass type structures that are used to grow plants in areas with cold temperatures. These glass structures absorb and trap the sunlight. Trapped sunlight results in an increase in temperature, leading to proper growth of plants. These gases also work in the exact same way: they keep the earth warm and at a constant level, capable of sustaining life. This is where the name Greenhouse gas comes from. Greenhouse gases play an important role in maintaining the earth’s temperature. They also safeguard the earth from the extreme heat of the sun, which if unchecked, could potentially burn down the earth. 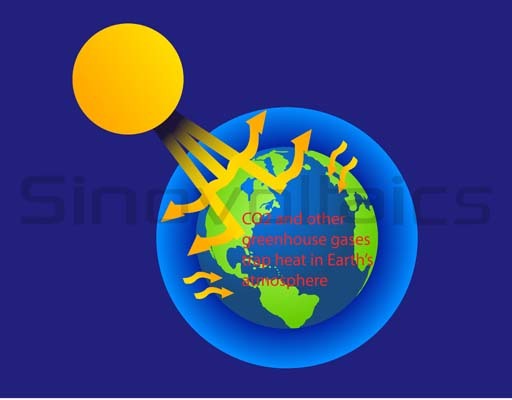 Water Vapor contributes to about 36 – 72% of the greenhouse gases, Carbon dioxide contributes to around 10 – 25%, Methane to around 5 – 10% and Ozone contributes to around 3 – 7% of the greenhouse gases. Following are the primary sources for Greenhouse gasses emission in the atmosphere. Electricity Production contributes to Carbon dioxide, Chloro Fluoro Carbons, Methane and Nitrous Oxide. Transportation contributes to Carbon dioxide. Industry contributes to Carbon dioxide, Chloro Fluoro Carbons, Methane and Nitrous Oxide. Commercial and Residential Buildings contributes to Carbon dioxide and Chloro Fluoro Carbons. Land Use and Forestry contributes to Carbon dioxide. Nowadays nearly anything you do, from travelling to turning on the light in your house, produces greenhouse gases. The production of greenhouse gases should be controlled so it will stop from being a threat to our earth’s environment. If produced in excess amount, these gases will trap more energy and eventually the earth`s temperature will rise. Rising temperatures will alter the whole eco-system of the earth. Following factors mainly contribute to the excess emission of greenhouse gases in the atmosphere. Increasing Population leads to greater demands for fossil fuels, machines and equipment which eventually leads to excess emissions of Greenhouse gases. Industrialization is producing more greenhouse gases than required. Human activities, such as Deforestation, burning fossil fuels, pollution and many others. How can solar energy reduce Greenhouse emissions? We can assume that the average household with a solar installation in the USA produces about 11,000 kWh per year. This is the common energy usage per household in the US. If we supply this energy by burning coal, the coal plant would emit 7.70 metric tons of CO2 per year, or nearly 200 tons over the estimated lifetime of the pv system.